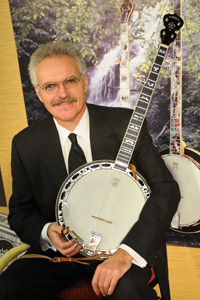 Deering Banjo Company in introducing his dynamic walnut, signature, 5-string banjo available now at Mountain Music. Crafted from elegant, plain walnut, trimmed in ivoroid with black and white accent stripes, bearing a regal inlay pattern designed by Greg Deering, the banjo is set up to Terry's personal specifications. The neck shape has been tailored to Terry's needs for comfort, and the fast and accurate fretting demanded by his hard-driving playing style. Set up includes an 11/16" bridge with slightly wider string spacing and a banjo head tuned to "A". Terry says of the banjo's stage presence, "It's like its up there and you got a mission. It's there to help you with the mission and you don't have to fight it at all." The rim is made of red maple, precisely fitted with a newly designed, lighter weight than the standard Deering '06 tone ring. The balance of the weight of the Terry Baucom tone ring and the red maple rim's musical response produces a more resonant sound chamber. From bass notes to highs, every note is clear and balanced in volume up the entire neck. Ushering in a new realm filled with opportunities for musical innovation, the Terry Baucom signature model is clearly a banjo to be reckoned with! #2 in our store now!